Valeri Lilov Sr. is a FIDE Arena Grand Master, father, and trainer of IM Valeri Lilov. He has been playing chess for many years and taught IM Valeri Lilov the rules of chess when he was only 3. In addition, he has been IM Lilov’s personal trainer and second ever since. Having more than 25 years of experience as professional chess coach, IM Valeri Lilov Sr. has devoted most of his time to training talented kids chess at the prestigious High School of Math in Varna, Bulgaria. Among his most recent victories in professional chess tournaments are two first prizes at the Varna City Chess Championship. Being a regular internet chess player, AGM Valeri Lilov Sr. makes the current Blitz Top 100 list at Playchess server. His FIDE online rating is 2503. IM Valeri Lilov, better known as Tiger Lilov, is a professional chess coach and lecturer renowned for his personalized approach to training students and professional players from all over the world. 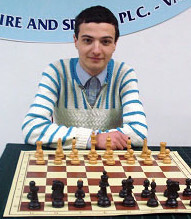 Born in 1991 in Varna, Bulgaria, Valeri first learned to play chess at the age of three. Having been an active tournament player all his life, he has won many international open tournaments and championships including the European Individual School Chess Championship U10 (Moscow, 2000) and the Kulaga Memorial International Open (Minsk, 2007). His achievements to date have earned him the International Master title, as well as an official FIDE rating of 2438. IM Valeri Lilov’s chess training career started over a decade ago when he was first giving lessons in Bulgarian and then in English over the internet. He is now a popular personal trainer and professional lecturer with many publications with ChessBase, Chess.com, ICC, ChessLecture.com, and ChessCube.com among many others. His ChessBase DVDs are especially popular in Germany and the U.S., while his ChessLecture.com videos are viewed by thousands every day.